Welcome back to Transportation Weekly; I’m your host Kirsten Korosec, senior transportation reporter at TechCrunch. We love the reader feedback. Keep it coming. Never heard of TechCrunch’s Transportation Weekly? Catch up by reading the first edition here or check out last week’s edition, which offered the gamut of mobility news from Lyft and Bird to Waymo’s laser bears and cybersecurity. As I’ve written before, consider this a soft launch. Follow me on Twitter @kirstenkorosec to ensure you see it each week. An email subscription is coming! Mark Harris is back with new details on Uber’s autonomous vehicle technology program. 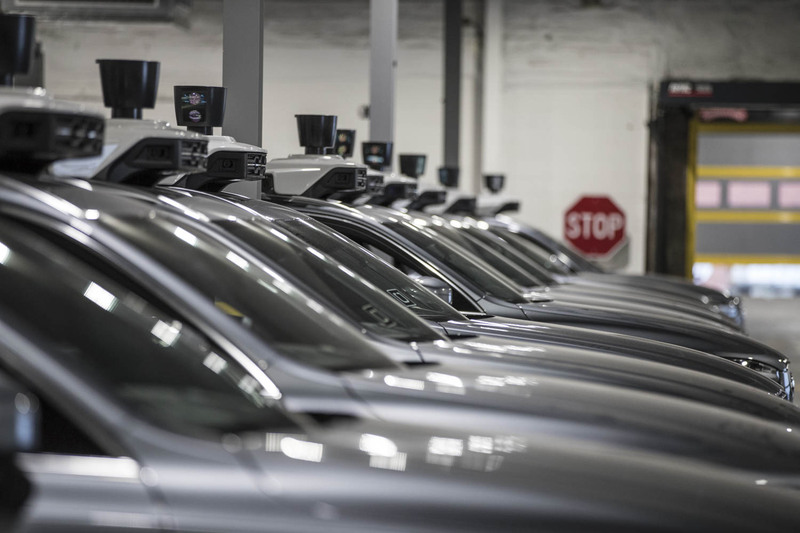 The upshot: Uber was spending $20 million a month to develop self-driving technologies. The new information, gleaned from recently unsealed court documents, provides new insight into the company’s past activities and what that might mean for its upcoming IPO. This historical look at Uber and its self-driving tech unit, Uber ATG, should be considered alongside more recent news, including that it’s in negotiations with investors, including the SoftBank Vision Fund, to secure an investment as large as $1 billion for its autonomous vehicles unit. 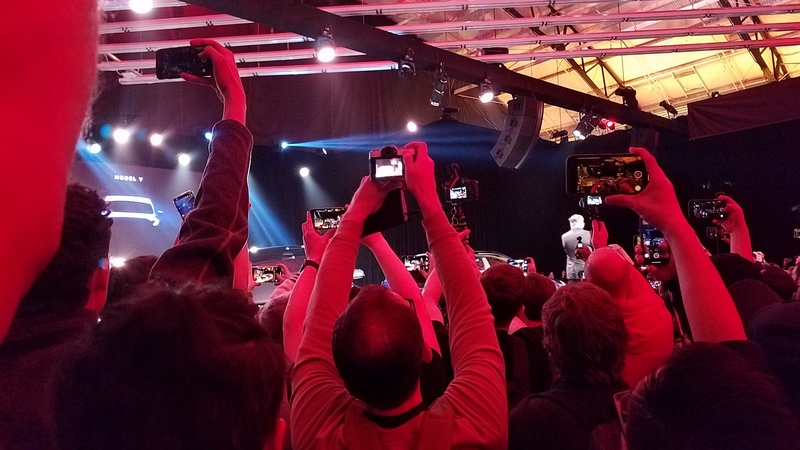 After five days in Austin for SXSW, I headed to Los Angeles, actually Hawthorne, for Tesla’s Model Y unveiling. In many ways, this was like all the other Tesla events I’ve attended: the pumpy music and mood lighting, the designed-to-inspire kick off video, the Tesla superfans (pictured below), and the long lines for a brief test ride. And yet, something was different. The Model Y unveil reminded me of other more traditional automaker reveals. There were mutterings at the event, and wild cries on Twitter, of disappointment (there were plenty of platitudes as well). Many expected something more exciting than this Model 3 doppelganger. The Model Y is the kind of next act one might expect from an established and more cautious automaker. 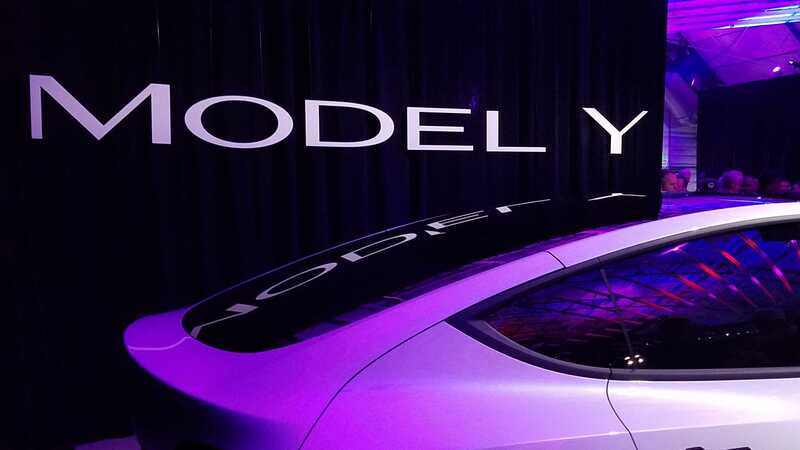 And while the market’s reaction was negative, there were folks who noted that the Model Y’s likeness to the 3 meant it was getting serious about selling vehicles. And that’s not a bad thing — accept for two niggling details. First, the Model Y is so similar to the 3 that it could suffer from buyer malaise or cannibalization of one of the two vehicles. Secondly, even if everyone loved this vehicle and Tesla was poised to take advantage of these perceived efficiencies gained from sharing at least 75 percent of the parts with the Model 3, the Y isn’t coming until fall 2020. That lengthy timeline raises a lot of questions that we’ll be (and surely others) digging into in the coming weeks and months. Where Tesla chooses to produce the Model Y is perhaps the most important, unanswered question. Welp, we didn’t anticipate this happening. Two tips turned into stories this week: Ford expanding its autonomous vehicle program to Austin and GM Cruise ramping up its hiring machine with plans to hire at least 1,000 more engineers by the end of the year. What else are we hearing? There’s a new autonomous trucking company coming out of stealth. We’ll share more soon. It’s not a done deal, yet. But it’s just an intriguing. Uber is in talks with Softbank Vision Fund and Toyota to raise $1 billion for its self-driving unit Uber ATG. This investment would give Uber ATG a valuation of between $5 billion and $10 billion, WSJ reported. The talks are fluid and could still fall apart, these people warned. There is a lot of behind-the-scenes investment and partnership activity in the autonomous vehicle space these days. In short, these relationships are getting messy and hard to follow. Let’s not forget that Softbank’s Vision Fund already has a nearly 20 percent stake in GM’s self-driving subsidiary GM Cruise following its $2.2 billion investment in 2018. Then there’s Volkswagen AG, which is in continued talks with Ford to partner on self-driving car technologies. The framework of the agreement is expected to include VW making an investment into Ford-backed autonomous vehicle startup Argo AI. VW already has other partnerships. VW Group, Intel’s computer vision subsidiary Mobileye and Champion Motors said in November they plan to deploy Israel’s first self-driving ride-hailing service in 2019 through a joint venture called New Mobility in Israel. VW also has a partnership with AV startup Aurora to integrate self-driving systems in custom-designed electric shuttles for VW’s new Moia brand. BMW i Ventures invested in Bright Machines, a San Francisco-based company that has combined software and robotics to help automotive, computer and electronic brands improve product quality, throughput, and factory optimization. Toyota Motor, DENSO Corporation, and Toyota Tsusho Corporation made a $15 million investment into connected vehicle services startup Airbiquity. The four parties will collaborate to accelerate the development and commercialization of an automotive grade over-the-air (OTA) system enabling remote vehicle software updates and management. I spent the week in Austin to participate in a number of SXSW-related events, including a couple of panels. As MRD notes in the micromobility section below, scooters were everywhere. And I used them a lot. Here’s what many might not have considered as they zipped along the streets, and sidewalks of Austin. The new new new thing often kills off something else, or at least forces it to change. Which brings me to pedicabs. 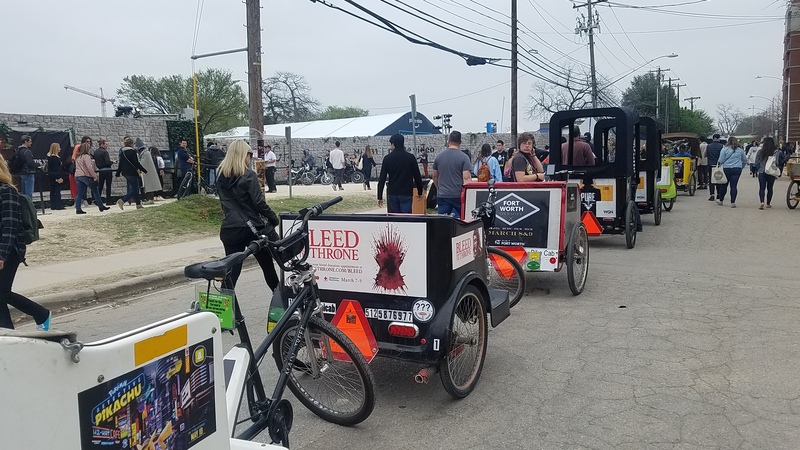 The snapshot below is a long lineup of empty pedicabs in downtown Austin. I saw these pedicabs-sans-riders everywhere in Austin. I remember SXSW just one year ago and the pedicabs were full; I took them several times that week. But now, scooters and bike share are here, and the pedicabs seem to be the ones suffering the most. I hired a pedicab during my stay and the driver confirmed my observations: they’re waiting much longer for customers now. Sometimes that disruption can hit the new new thing too. Take bike share. The Austin City Council on approved in February 2018 the creation of a “dockless” bike share pilot program. Some companies were already operating these services; this action created a regulatory framework. But then scooters came en masse. City officials and one dockless mobility executive told me that scooters upended bike share, and prompted companies to take some of their bikes off the streets do to lack of demand. It seems like everyone is riding scooters now. Case in point, Austin during SXSW. MRD weighs in on what went down. I wasn’t in Austin this week for SXSW. And it’s a good thing I wasn’t because there were reports of a tornado! Well, a tornado of scooters. According to The Verge, scooters and bikes were out and about, enabling the hundreds of thousands of conference goers to get from one bar to the next — and from one session to the other. Micromobility data platform Populus raised some skrillz — $3.1 million, to be exact. That’s in part because, while cities are down for this new era of transportation and operators are down to share their data, cities still have to find out what to do with this data and how to extract learnings from it. This is where Populus comes in. Populus raised the seed round from Precursor Ventures, Relay Ventures and others to help cities make sense of the influx of transportation data. This brings the startup’s total funding to $3.85 million. And … just because scooters are hot right now, doesn’t mean companies aren’t facing headwinds. The Information reported that Bird has laid off between 4 to 5 percent of its workforce. Navigant Research released its annual, and often controversial autonomous vehicle leaderboard report, by principal analyst Sam Abuelsamid. 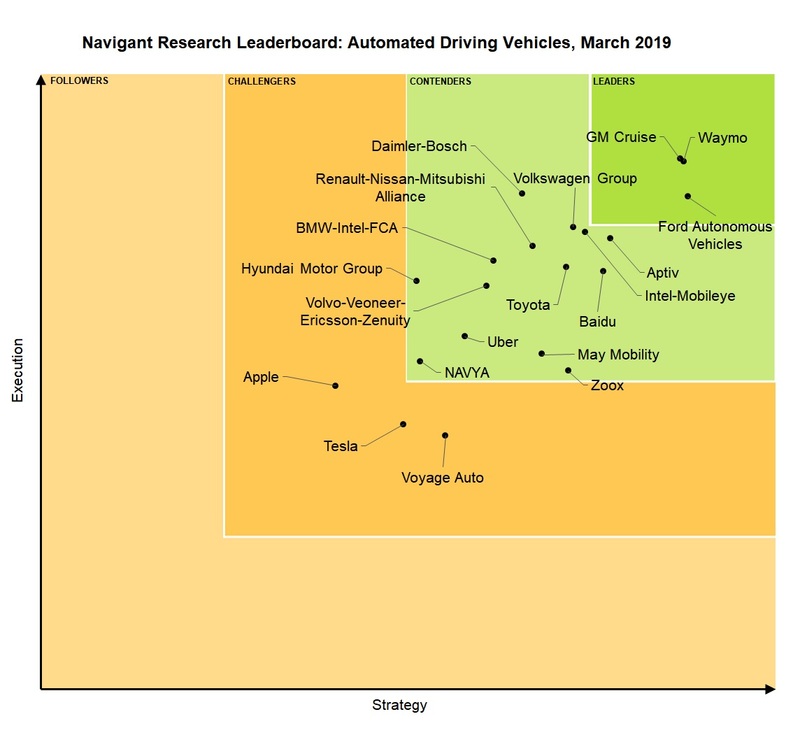 The Navigant Research Leaderboard examines the strategy and execution of 20 leading automated driving system companies and rates them based on 10 criteria, including vision; go-to market strategy; partners; production strategy; technology; sales, marketing, and distribution; product capability; product quality and reliability; product portfolio; and staying power. expecting no acceleration in e-commerce adoption trends, KMPG estimates that by 2040 e-commerce will reduce shopping trips in the U.S. by 30 percent. It could be as high as 50 percent. as a result, delivery vehicle miles traveled will skyrocket from 23 billion annual miles to more than 78 billion by 2040. 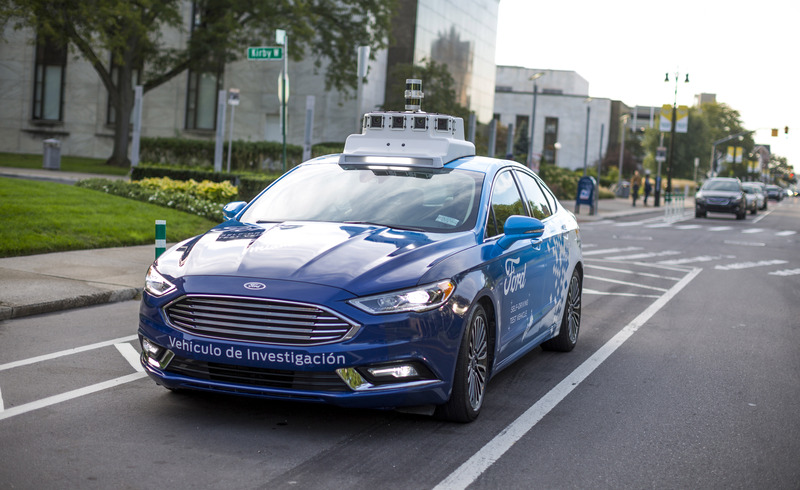 Ford continues to expand its autonomous vehicle program. This time, the automaker is setting up shop in Austin. During my week in Austin for SXSW, I had heard rumors that Ford was preparing to open an autonomous vehicle program there. A number of Ford executives were on the ground in Austin during SXSW to participate in panels and other events including one I moderated at the Smart Mobility Summit. That chatter was confirmed by a new job listing for an autonomous vehicles “market specialist” based in Austin. Austin is the fifth city to join the automaker’s testing program, which already includes Detroit, Miami, Pittsburgh and Washington D.C. Meanwhile, Los Angeles is getting ready for a widespread deployment of scooters. About seven companies already have permission to operate on a conditional basis, according to Los Angeles Department of Transportation’s general manager Seleta Reynolds. Now it’s about to get bigger. The city recently launched a one-year dockless on-demand personal mobility program. As part of that program, the LADOT accepted applications from companies seeking one-year permits. Eleven companies applied for permission to operate about 38,000 dockless devices. The city is prepping for coming deluge by creating designated parking areas and other signage. That sounds like a lot; and it is. But it could have been a much higher number. If these companies had maxed out the total number allowed under the permit, it could have meant 160,000 scooters in Los Angeles. Why wouldn’t Bird, Lime, Spin and others max out the allowable 10,500 scooters per permit? Here’s one thought: cost and supply. The annual permit application fee is a non-refundable $20,000. Companies also most pay $130 fee per vehicle annually if they’re operating in non-disadvantage communities (DAC). LADOT is allowing companies a maximum of 3,000 scooters in non-DAC areas, 5,000 in DACs in San Fernando Valley and up to 2,500 in DACs in outside of San Fernando Valley. Permits for scooters in DACs are $39 per vehicle, a 70 percent reduction in that fee. That means if a company could max out and hit the 10,500 scooter limit, which includes DACs, it would be looking at more than $700,000 in permitting fees to operate for a year. Gridwise, a mobile app designed to increases rideshare drivers’ hourly earnings by helping them find more rides and track their performance, launched in a number of cities, including Austin, Dallas, Houston, Los Angeles, and Phoenix. Gridwise app is already available in numberous U.S. cities such as Baltimore, Boston, Chicago, New York City, Pittsburgh, Philadelphia, and Washington DC. And Citymobil, one of the largest Russian taxi aggregators, has teamed up with Gazprom to launch a taxi runs on natural gas. About 500 taxi cars that participate with Citymobil have already been converted to work on methane. By the end of the year, their number is expected to reach 10,000. TechCrunch will be at Nvidia’s annual GPU Technology Conference from March 18 to 21 in San Jose.